The Roots of Smooth” with Bobby Jackson is a music program, that more broadly displays how music connects us to a global community. This hour-long series showcases artists playing their music, and the music of their influences both in and outside of the jazz world. You’ll hear the music of their peers, and the young artists they have influenced. It is an engaging smart blend. Hear the personal journeys of legends such as Grover Washington Jr. and Toots Theilemans as well as the latest generation of players including Esperanza Spaulding and Amina Figarova. The Roots of Smooth puts a “human face” on the music, deepening listeners’ connection to artists who come from every corner of the globe, using their voices to share stories of how their life experiences and passions helped shape the music they make and enjoy. The show is a “Jazz Gumbo Lens”, drawing connections among all genres of music. 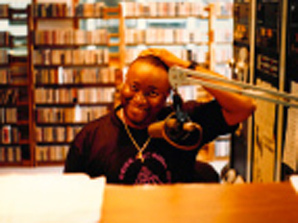 Multi-award winning Host/Producer Bobby Jackson, a 25-year veteran broadcaster says, “The Roots of Smooth” provides a platform for all music genres to organically coexist on the same program. The combination of music and commentary reveals music is an experience that speaks to us all. It is not smooth jazz. It is THE ROOTS of smooth. It is fun and THAT’S what makes it “smooth”(1 Hour Week).